Add a memorable final touch to any special event or gathering with Plixio's floating Chinese paper lanterns. In different parts of Asia, floating lanterns have traditionally been used during festivals and parties to help celebrate special occasions. Many people even like to attach a wish to their lantern as a symbolic gesture. Today, these lanterns are used to help bring in the new year, to send off newly married couples, and to add a final touch to family get togethers. Each pack of Chinese paper lanterns includes two lantern shapes: a rounded top and a diamond shape. Each lantern's lamp base is made of flame retarded biodegradable paper and includes a small wax based fuel cell and a set of instructions printed on the sleeve. Lanterns should be used in a clear area free of trees, debris and homes. Water should be within easy reach and children should not launch lanterns without an adult present. Lanterns should not be launched within five miles of airports or flight paths. 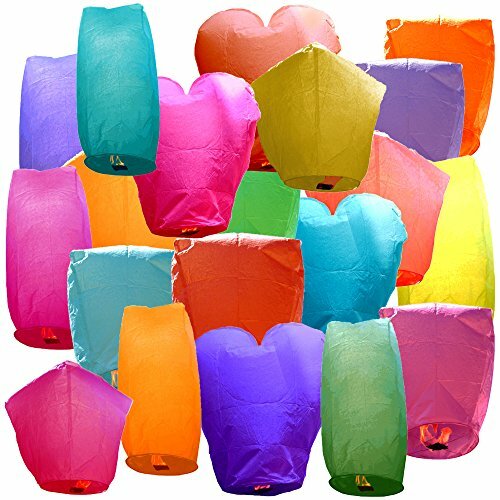 Our Chinese sky lanterns come in a variety of colors to liven up any wedding, barbeque, birthday party or get together. 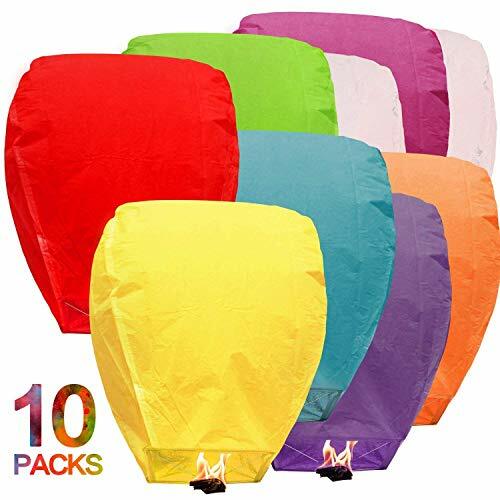 Each pack includes 20 floating sky lanterns in a random mix of colors and 20 squares of a wax based flying fuel. Our color variety includes: blue, pink, yellow, purple, red, green and white. Each flying paper lantern comes with a special fuel cell and can reach a flight height of up to 1000m and the fuel can last from 10-15 minutes. These lightweight sky lanterns can be drawn on and customized with fire safe materials. The flame-resistant paper is biodegradable and the fuel cell is environmentally friendly. 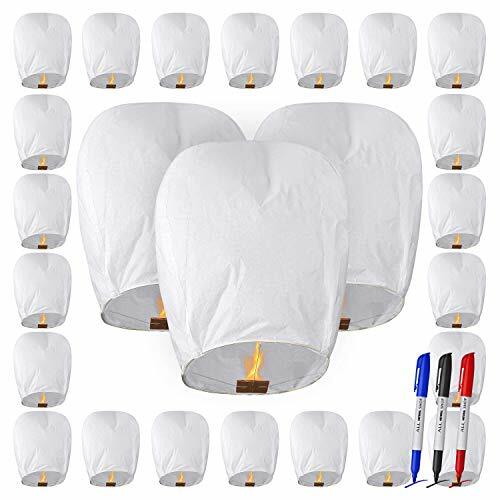 Just Artifacts 20pcs ECO Wire-Free Flying Chinese Sky Lanterns (Set of 20, Eclipse, White) - 100% Biodegradable, Environmentally Friendly Lanterns! What could be more dramatic and beautiful than the sight of Chinese flying Sky Lanterns rising into the night sky with a gentle glow? These lovely floating sky lanterns aren't just party decor, but part of the entertainment as well! And with Just Artifacts' affordable pricing, you can order plenty of Chinese sky lanterns to light up the night. These Chinese lanterns come in many different styles and shapes, such as Cylinder, Heart, Diamond and Eclipse Shapes. We also carry specialty flying sky lanterns, such as patterned sky lanterns with a holiday or sports themes and jumbo sky lanterns that impress your guests in a big way. All the floating Sky Lanterns that Just Artifacts sell comes with their own fuel cells that are attached. Our Sky Lanterns are made of fire-resistant paper and biodegradable material (Rice Paper) to ensure a clean and safe environment. Shop our selection of flying Chinese lanterns and let them get your party off the ground! We wish you have a wonderful party. We have sold over 1 MILLION LANTERNS!! 100% CUSTOMER SATISFACTION GUARANTEE! - When you're happy, we're happy! Buy with the confidence of our Satisfaction Guarantee. All Just Artifacts party products are shipped from within the USA! WHATS INCLUDED? - Twenty (20) Just Artifacts ECO Wire-free Blue Eclipse shaped sky lanterns with pre-attached fuel cells. All ECO Wire-free Sky Lanterns are 100% Biodegradable. Metal Wire has been replaced with a fire RESISTANT string. DISTANCE: Push the distance with our EXCELLENT quality Sky Lanterns. Eco Wire-free Sky Lanterns can fly up to 1,000m or more! Colored Sky Lanterns are a great addition if you intend to fly your Kongming Chinese Lanterns at night. 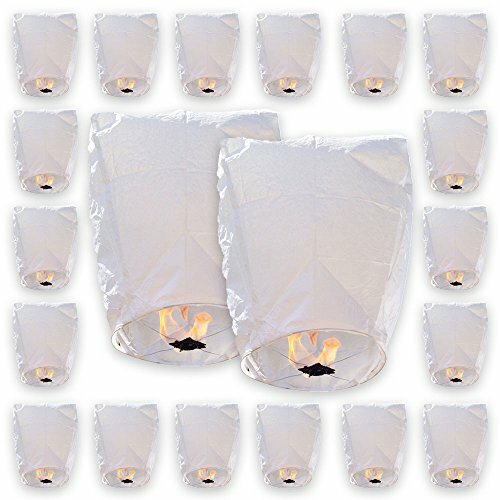 All Natural Shop Chinese Sky Lanterns 25 Pack - White, Eco Friendly, 100% Biodegradable. Wire-Free Paper Japanese Prime Paper Sky Lantern to Release in Sky. All Natural Shop Paper Sky Lanterns Come 100% Assembled For Easy Use! Here's What's Included: (25 White) Individually Wrapped Large Wire Free Sky Laterns. 100% Biodegradable For Weddings, Birthdays, Funeral Memorials, In Memory Of & More! Also Includes 2 Ebooks & 3 Markers! 1) 100% ECO FRIENDLY - Our Asian Lanterns Are Made From Eco Friendly Materials Such As: Fire Resistant Rice Paper, Fire Resistant String, Cotton Wax Fuel Cell, And A Bamboo Wooden Frame. 2) WHATS INCLUDED? - (25) All Natural Shop Eco-Friendly Chinese Sky Lanterns With Pre-Attached Cotton Wax Fuel Cell! For Wedding, Birthday, Memorial & More! - If you're looking for sky lanterns 50 pack, just add 2 units to your cart. Also a great buy if you're looking for 20 sky lanterns. 3) FUN FOR EVERYONE! - Adults and Kids Will Enjoy These Chineses Sky Luminaries. 4) HOW HIGH WILL THEY GO? 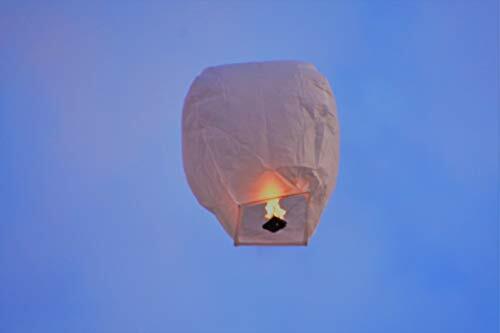 - Our Jumbo Float Lanterns To Release In The Sky Fly Up To 7 Minutes And Reach Heights Of 3,000 ft! 5) SATISFACTION GUARANTEED! - If For Any Reason You Are Not Satisfied With Our Japanese Sky Lantern or Shipping, Email Us And We'll Gladly Assist You. Never Fly Your Wish Lighted Lanterns If There Is Wind Present. To Ensure A Safe Launch, Only Fly Wishing Sky Lanterns To Release In Sky On Days With Calm Weather Conditions. Wind Can Result In Your Chineese Sky Lantern Falling Back To Earth, Or Flying Into Other Items Before It Has Safely Reached The Desired Altitude. We Advise All kongming Sky Lantern Users To Please Be Careful And Use Sound Judgment. *Disclaimer: Purchasing Sky Latern From All Natural Shop, You Accept All Responsibility For Any Injury, Damages, Or Criminal Charges That Result From The Release Of The Floating globos de cantoya. We Advise Checking With Your Local Fire Marshall To Ensure Your Sky Lanterns Are Not Prohibited In Your Area. 100% ECO FRIENDLY- Our Paper Sky Lanterns To Release Are Made From The Best Biodegradable Materials. FUN FOR EVERYONE! - Adults and Kids Will Enjoy Our Wire Free Prime Flying Lanterns To Release In Sky. HOW HIGH WILL THEY FLY? 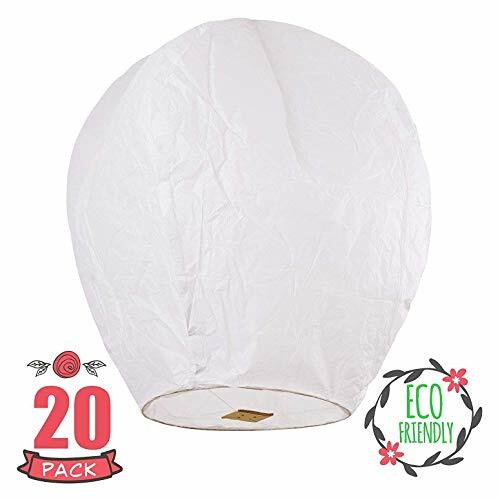 - Our Sky Paper Lanterns Biodegradable Reach Heights Of Over 3,000 Feet! OUR GUARANTEE!- If The Sky Lanterns Doesn't Meet Your Needs, Message Us & We'll Reply In 15 Minutes. Be Sure To Order Only From Coral Entertainments As A Seller To Receive The New And Improved Kit, Including A New Designed Fuel Cell, New Shape And Size That Has Been Tested For Best Result With Quality And Flying Time. Celebrate The Holidays Or Events With A Unique Chinese Lantern From Coral Entertainments. Whether You're Celebrating A Birthday, Wedding, Valentine's Day Or Just The Start Of Summer Vacation, Nothing Quite Sets The Reflective Mood Like A Chinese Paper Lantern. Watching Them Soar High Above The Clouds Is A Fun, Relaxing And Calming Opportunity To Share Unique Moments With Friends, Family, And Those You Love. We've Crafted The Coral Entertainments Paper Lanterns With Eco-friendly Fuel, Rice Paper, A Bamboo Ring, And Eco-Friendly String So We Can Keep It Durable, Yet Environmentally Friendly. If You're Looking To Share A Long-Standing Eastern Tradition With Your Friends And Family, Then Choose The Coral Entertainments Chinese Paper Lantern And See How High You Can Get Yours! Make Your Next Evening Get Together One You'll Never Forget By Clicking "add To Cart" Above! Don't Forget To Make A Wish ! REGISTERED TRADEMARK IN THE USA! Our unique Chinese lanterns Each paper lantern lights up the night sky for an unforgettable experience. Our premium Chinese festival lanterns are perfect for weddings, New Years Eve, graduations, anniversaries, any other festive event, valentines, parties, outdoor bonfires, birthdays, memorials, ceremonies, funerals, Christmas and just because. CREATE YOUR OWN CHINESE LANTERN FESTIVAL AT HOME - What's more impressive than Chinese lanterns flying in the air? Our flying paper lanterns will make any celebration more memorable. ECOFRIENDLY DESIGN - Flying lantern paper is made of rice and yellow cotton, so you don't have to worry if it gets caught in a tree. Hanging lanterns will eventually become one with Mother Earth, since they're 100% biodegradable. RELEASE YOUR PAPER LANTERNS SKY HIGH - Paper lanterns fly for up to 9 minutes and reach heights of over 3,000 feet! For Halloween, engagements, father day, hot balloons and much more. All Natural Shop Paper Sky Lanterns Come 100% Assembled For Easy Use! 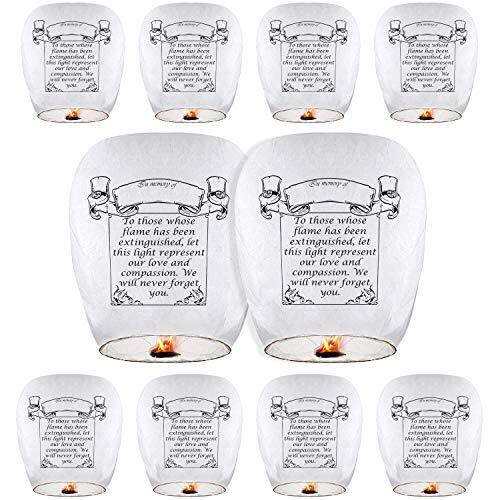 Here's What's Included: (11 White) Individually Wrapped Large Sky Laterns That Are Wire Free And 100% Biodegradable For Weddings, Birthdays, Funeral Memorials, In Memory Of & More! 1) 100% ECO FRIENDLY - Our Asian Sky Lanterns Are Made From Eco Friendly Materials Such As: Fire Resistant Rice Paper, Fire Resistant String, Cotton Wax Fuel Cell, And A Bamboo Wooden Frame. 2) WHATS INCLUDED? - (11) All Natural Shop Eco-Friendly Chinese Sky Lanterns With Pre-Attached Cotton Wax Fuel Cell! For Wedding, Birthday, Memorial & More! 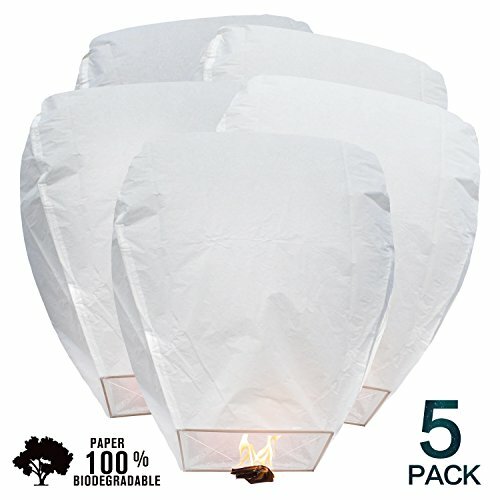 - If you're looking for sky lanterns 5 pack, just add 2 units to your cart. Also a great buy if you're looking for 10 sky lanterns. 3) FUN FOR EVERYONE! - Adults and Kids Will Enjoy These Wire Free Chinese Sky Luminaries. 4) HOW HIGH WILL THEY GO? - Our Jumbo Float Lanterns To Release In The Sky Fly Up To 7 Minutes And Reach Heights Of 3,000 ft! 5) SATISFACTION GUARANTEED! - If For Any Reason You Are Not Satisfied With Our Chinese Japanese Sky Lantern or Shipping, Email Us And We'll Gladly Assist You. Never Fly Your Wish Lighted Lanterns If There Is Wind Present. To Ensure A Safe Launch, Only Fly Wishing Sky Lanterns To Release In Sky On Days With Calm Weather Conditions. Wind Can Result In Your Chineese Sky Lantern Falling Back To Earth, Or Flying Into Other Items Before It Has Safely Reached The Desired Altitude. We Advise All kongming Sky Lantern Users To Please Be Careful And Use Sound Judgment. *Disclaimer: Purchasing Sky Latern From All Natural Shop, You Accept All Responsibility For Any Injury, Damages, Or Criminal Charges That Result From The Release Of The Floating globos de cantoya. We Advise Checking With Your Local Fire Marshall To Ensure Your Send Off Lanterns Sparklers Are Not Prohibited In Your Area. WHATS INCLUDED? 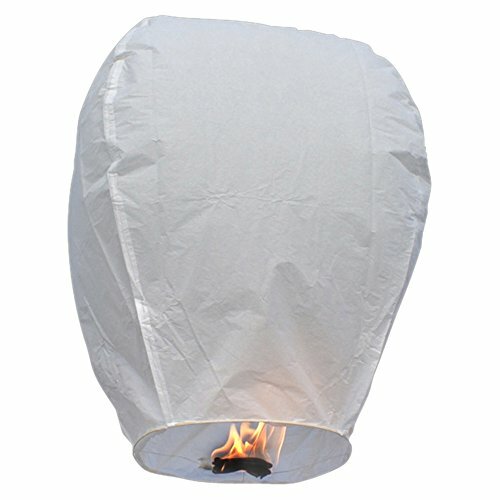 (11) Eco Friendly Chinese Sky Lanterns For Weddings, Birthdays, Memorials & More! With Pre-Attached Fuel Cell, 2 Free Ebooks & 3 Markers. HOW HIGH WILL THEY FLY? Our Sky Paper Lanterns Biodegradable Reach Heights Of Over 3,000 Feet! OUR GUARANTEE If The Sky Lantern Doesn't Meet Your Needs, Message Us & We'll Reply In 15 Minutes. Celebrate love or commemorate a loved one with LionCo's large paper lanterns. Wedding guests will swoon as the groom dips to kiss his bride in front of a backdrop of dancing wedding lanterns. Send your personal message at a family memorial or celebration of life with a paper sky lantern. No matter the occasion, these hot air balloon decorations are sure to exquisitely illuminate the sky. Make memories with friends and family as you watch your eco friendly paper lanterns float away. You'll love LionCo's sky lanterns for you next event. With 20 white lanterns PLUS 1 blue and 1 pink lantern in each pack, you can light up your night and rest assured your lanterns aren't harming the environment. Contact local fire department to ensure they're legal in your area Carefully remove plastic sleeve and protective sheet from fuel block Gently shake lantern open (material is thin to float better), fully extend, and hold lantern from the top in an upright position Have your partner light the fuel source Hold lantern for 1 minute as it inflates When the lantern starts to rise, guide it up, and let it go Make a wish as it floats away! Make your next celebration sparkle! Add LionCo's Paper Lanterns to your cart today! LIGHT UP YOUR SKY - Add an exquisite touch to any celebration with whimsical white lanterns by LionCo! They're enchanting for the whole family (with supervision) and perfect for weddings, memorials, family gatherings, and holidays. These lovely paper sky lanterns will captivate you and your guests as they illuminate the night sky. ECO-FRIENDLY - Finally, there's a paper lantern that's safe for the environment! Our paper lanterns are completely biodegradable with a cotton wax fueling cell and a bamboo frame. The strings holding the fuel cell are fire-resistant, while the rice paper is fire retardant to nix any lasting flames. Celebrate safely and confidently with Eco-Friendly Paper Lanterns. PERFECT PARTY PROP - Light and fly the lanterns to celebrate love and life! Set these wish lanterns free as a stunning backdrop for your wedding and a beautiful memory for yours guests to participate in! Plus, they're an elegant way to celebrate and memorialize a loved one's celebration of life. 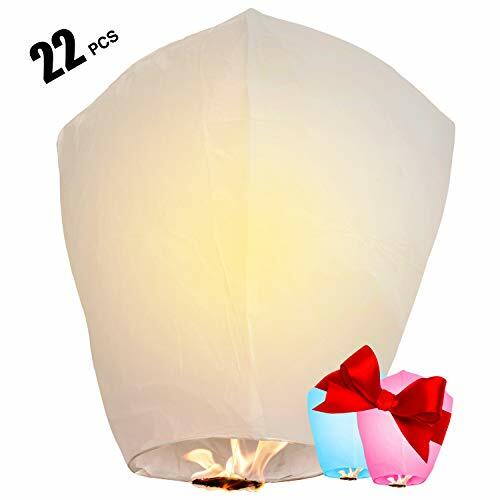 2 BONUS LANTERNS - Every 20-pack of white paper lantern lights includes 1 pink and 1 blue FREE floating lanterns. Make your birthday girl feel special with the pink lantern, or use the pink and blue for picture-perfect wedding day photo props! OUR PROMISE - We're sure your wish lanterns will make the stunning finale to your celebration. But we don't want anything getting in between you and your special day, which is why we'll do all we can to help if your lanterns are damaged upon delivery. Watch in awe as your paper lanterns light up your next event! MEANINGFUL STORY: Chinese Paper Lanterns are also known as wish lanterns or sky lantern or Kongming Lantern, It is said they were invented by a hero whose name was Kongming. you can draw pictures, write your personal messages, wishes or your lover's name on the wishing lantern. Don't forget to make a wish when Chinese wishing paper lanterns fly to sky, it is said that it will achieve your dream. ENVIRONMENT FRIENDLY: This premium white Kongming wishing fire laterns are made of fire resistant biodegradable paper, which is friendly to environment. WIDE APPLICATION, QUANTITY AND COLOR: Color: white. 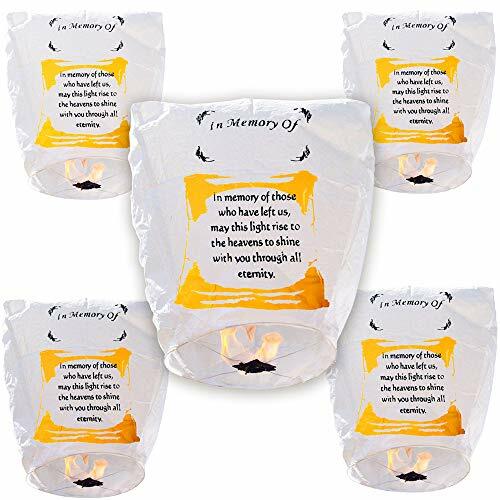 50 pack Chinese Paper wishing Lanterns are ideal for wedding, holiday, birthday, camping and other celebrations parties. It is also perfect as Christmas gift for children. DIMENSION AND SHAPE: Its dimension is (15 x 13.8 x 3.9) / (38 x 35 x 10)cm (L x W x H). Shape: oval. CAUTION: Consult with your local fire marshall to ensure flying sky lanterns are permitted in your area. You should use these wish lanterns in open air in order to keep safe. Chinese Paper Lanterns, in China, they call them Kongming Lantern. It is said they were invented by a hero whose name was Kongming. that can provide a finale to your big day that you and your guests will remember forever! personal messages, wishes or your lover?? s name on the lantern paper. So good luck, my dear friend! enclosed with every Sky Lantern. - Always keep water or fire extinguishers nearby. - Children must not be left unattended with the lanterns. - Make sure that you familiarize yourself fully with the instructions provided. - Ensure that the wind is not stronger than 5 mph. - Ensure that trees are not in the flight path. - Must be released more than 5 miles away from any airports. - Do not use around dry crops. are no obstacles. Ensure the lantern is fully opened, not creased or at an angle. near the coast, as they can get confused with distress flares. - No warranty for lantern as specail items. - There exists some color shading. Package included: 5 X SKY LANTERNS,Each paper lantern lights up the night sky for an unforgettable experience. Our premium Chinese festival lanterns are perfect for weddings, New Years Eve, graduations, anniversaries, any other festive event, valentines, parties, outdoor bonfires, birthdays, memorials, ceremonies, funerals, Christmas and just because. 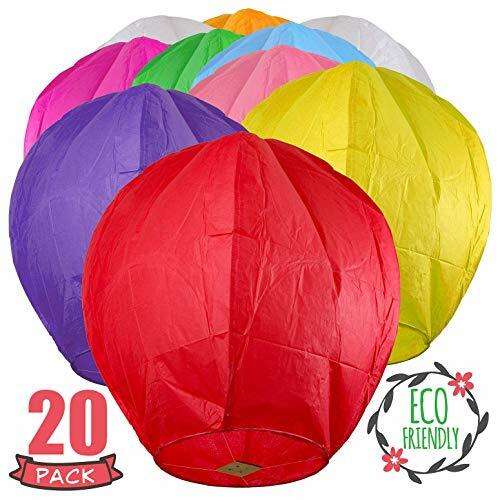 Just Artifacts 20 Eco Wire-free Assorted Chinese Flying Sky Lanterns (20-Pack, Assorted Shapes & Colors) - 100% Biodegradable, Environmentally Friendly! WHAT'S INCLUDED? 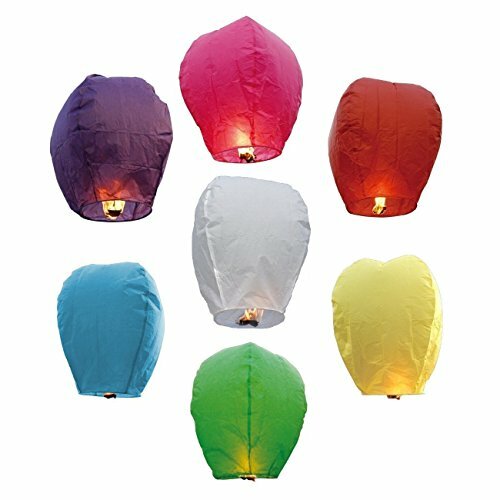 Twenty (20) Assorted Shapes/Colors ECO Wire-free Sky Lanterns. All Sky Lanterns will come with pre-attached Fuel Cell. All ECO Wire-free Sky Lanterns are 100% Biodegradable. Metal Wire has been replaced with a fire RESISTANT string. Paper lanterns gives you the tools you need to celebrate any occasion. events, our lanterns are easy to use and come fully assembled for your convenience. waste to the planet, even when your lanterns drift slowly out of sight. SAFE & BIODEGRADABLE - Each of our lanterns is made of biodegradable , flame resistant paper making it safer for the environment than other sky lanterns . Eco friendly design. flying lantern paper is made of rice and yellow cotton, so you don't have to worry if it gets caught in a tree. Hanging lanterns will eventually become one with mother earth since they're biodegradable. Try Risk-Free Today with Our 30-Day Money-Back Guarantee! It is recommended prior to purchase that customers check with their local fire marshal to ensure sky lanterns are legal in your county/state. Celebrate The Holidays Or Events With A Unique Lantern From Coral Entertainments. 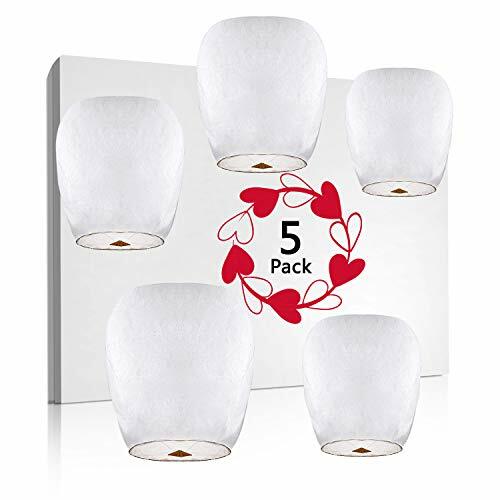 Whether You're Celebrating A Birthday, Wedding, Valentine's Day Or Just The Start Of Summer Vacation, Nothing Quite Sets The Reflective Mood Like A Paper Lantern. Watching Them Soar High Above The Clouds Is A Fun, Relaxing And Calming Opportunity To Share Unique Moments With Friends, Family, And Those You Love. We've Crafted The Coral Entertainments Paper Lanterns With Ecofriendly Fuel, Rice Paper, A Bamboo Ring, And Metal Wire So We Can Keep It Durable, Yet Environmentally Friendly. If You're Looking To Share A Long-standing Eastern Tradition With Your Friends And Family, Then Choose The Coral Entertainments Paper Lantern And See How High You Can Get Yours! Registered trademark in the USA. Make a statement. each paper lantern lights up the night sky for an unforgettable experience. Our premium Chinese festival lanterns are perfect for weddings, new years eve, graduations, anniversaries, any other festive event, valentines, parties, outdoor bonfires, birthdays, memorials, ceremonies, funerals and just because. Create your own Chinese lantern festival at home. what's more impressive than Chinese lanterns flying in the air. Our flying paper lanterns will make any celebration more memorable. Release your paper lanterns sky high, our wishes paper lanterns fly for more than 10 minutes and reach heights of over 3000 feet. Please watch our video. It is recommended prior to purchase that customers check with their local fire marshal to ensure sky lanterns are legal in your county/state. Very small when folded, large when ready to fly, storage and shipping are painless! Virtually impervious to tearing, and will unfold without sticking! All this and still constructed of 100% biodegradable yet fire resistant rice paper and bamboo! While our lanterns are fire resistant, the world is not! Do not use near anything that might catch fire, or in a place where you don't know where the wind will take it! Our favorite and most recommended place to send our lanterns aloft is out over the water - Choose your favorite beach, whether a lake or the ocean. The reflections over the water as the lanterns rise are beautiful, and after safely coming down in the water, they will almost immediately begin to come apart. So be careful not to let your lanterns get wet before you fly them! OUR LANTERNS ARE DIFFERENT!! High quality, rugged construction and ingenious folding make storage and shipping painless, while also making them resistant to tearing, and will unfold without sticking! Whether celebrating or remembering, send your thoughts, prayers, dreams, hopes and wishes to heaven in a celebration of light in the night sky. Ready to Fly and Simple to Use: Our lanterns come completely assembled in our special compact packaging that helps avoid damage during shipping and storage. No broken frames, ripped paper, or wick messes. Simply follow the directions on the package to unpack, light and launch your lanterns. When our lanterns return to earth, they truly return to the earth. All materials in our Flying Lanterns will naturally bio-degrade over time. Be Safe and Responsible! Do not use in any area where it is illegal or dangerous! Sky lanterns give you the opportunity to create a truly unique experience for your event or celebration that will be remembered. You can be sure that everyone will want to share the same memories with their friends and family at their events! When sky lanterns are simultaneously released into the night sky they create a truly mesmerizing display, which is both noiseless and epic. They are ideally suited for a multitude of celebrations such as Weddings, Birthdays, Anniversaries, New Year parties, back-yard BBQ's, tailgating and much more. They are easy to use and come complete with simple to follow instructions. Sky lanterns are also known as Khoom Fay, Khoom Loy, Kung Ming, Sky Lanternen, Himmelslaternen, Fire Lanterns or UFO Balloons. They utilize the heat of fire to create an unforgettable moment. These fully biodegradable lanterns are made out of rice paper, non-toxic wax and bamboo. They are fitted with fuel cells for a longer flight and will burn for 5 to 10 minutes and can fly over a mile high! Safety instruction:Please follow the instructions on the packaging and on the coloured instruction leaflet enclosed with every White Sky Lantern. Always keep water or fire extinguishers nearby. Children must not be left unattended with the lanterns. Make sure that you familiarize yourself fully with the instructions provided. Ensure that the wind is not stronger than 5 mph. Ensure that trees are not in the flight path. Must be released more than 5 miles away from any airports. Do not use around dry crops. Wear sensible clothing that is does not dangle around your hands or flap around any flame Check the direction of the wind prior to launch to verify flight path ensuring there are no obstacles. Ensure the lantern is fully opened, not creased or at an angle Please contact your local Coastguard station if you intend to use Sky Lanterns near the coast, as they may get confused with distress flares. LANTERNS FLY EXTRA HIGH: Part Of The Fun Is Watching How High A Lantern Can Go. 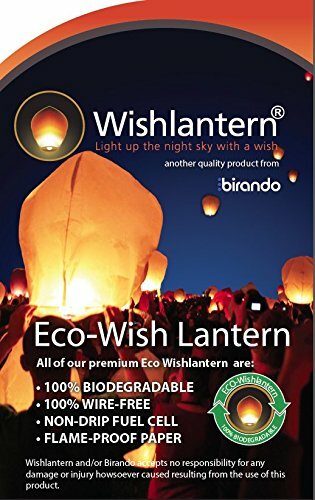 Wish Lantern continues to be at the forefront of lantern design and in July 2010 we became the first supplier in the USA to sell a 100% biodegradable wish lantern. Back in 2009 we started looking at replacing the small piece of wire in our traditional chinese sky lanterns with a fire resistant string that is capable of holding the burning fuel cell. We're proud to announce the arrival of our Eco Wish Lanterns. Constructed with a thin bamboo frame and rice paper to complete the lantern, along with a fire proof String instead of the regular metal wire that our other lanterns have, these lanterns are sure to biodegrade in a very short time after landing. 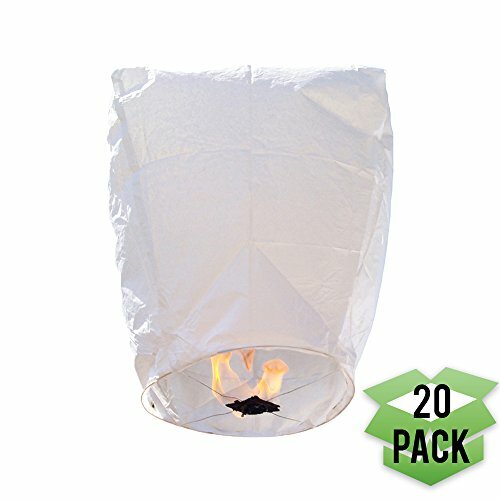 So if you're holding a special event in the near future and want to treat your guests to a beautiful display of white wish lanterns, as well as not being concerned about their impact on the environment, All our Wish Lanterns are individually wrapped and this pack has five Eco Wish Lanterns within it. Simply light the fuel cell at the bottom of the lantern, watch it fill with hot air and let it go into the night sky. Easy to light and launch within a minute or two. Made from high quality, biodegradable rice paper, string and bamboo. Bring a perfect end to your night with Wish Lanterns. Buy only Genuine Wishlantern Brand Sky Lanterns - Sold exclusively by Birando. Beware of cheap imitations! This premium white Kongming wishing fire laterns are made of fire resistant biodegradable paper, which is friendly to environment. Color: white. 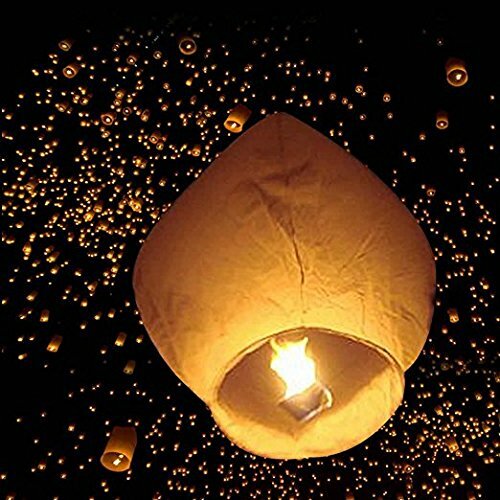 50 pack Chinese Paper wishing Lanterns are ideal for wedding, holiday, birthday, camping and other celebrations parties. It is also perfect as Christmas gift for children. : Its dimension is (15 x 13.8 x 3.9) / (38 x 35 x 10)cm (L x W x H). Shape: oval. CAUTION: Consult with your local fire marshall to ensure flying sky lanterns are permitted in your area. PLEASE READ ALL DIRECTIONS CAREFULLY BEFORE LAUNCHING LANTERNS. 1. Careful take lantern out of the package because the paper is very thin and will tear easily. 2. Carefully unfold paper and gently open lantern to its original shape as shown . 3. Open up the corners of the fuel pad-refer to Picture 1. Hold the lantern upright and then another person light two corners of the fuel pad-refer to Picture 2. 4. Hold the lantern at the top and bottom for 15 to 20 seconds, and then let the lantern go when it wants to tug away from your hands. 1. Keep the Lanterns in a dry area and avoid humidity. 2. Keep fire extinguisher nearby when launching lanterns. 3. Be sure to launch lanterns during calm and windless weather. The wind speed must be less than 5 miles per hour. 4. Never light lanterns in a building or house and always launch in an open area. 5. Avoid launching lanterns around trees buildings, houses, or any high obstructions that may catch lanterns. 6. Avoid launching lanterns within 5 miles of an airport. Avoid high voltage wires, transformers substations, and gas stations or any explosive or hazardous area. 7. Release the lantern immediately when it wants to uplift from your hands. Don't hold too long the fuel pad becomes very hot. 8. Don't tie anything to the lantern. 9. Children must have adult's supervision when launching lanterns. Sky Lanterns are operated with open fire. The user shall be solely responsible for any and all accidents that may occur while using and launching the Sky Lanterns. Manufacturer Wholesaler Retailer and Shipper are held unaccountable for any and all accidents. Using this lantern, you are said to have full knowledge and understanding of the proper use of launching SKY LANTERNS and accept this DECLARATION. THESE LANTERNS ARE SAFE WHEN USED CORRECTLY-THEY ARE NOT TOYS AND SHOULD NOT BE USED BY CHILDREN. [ENVIRONMENTALLY FRIENDLY] The whole sky lanterns is 100% biodegradable and eco-friendly . Biodegradable Rice Paper, Cotton String and Bamboo. The lanterns will degrades rapidly after falling. [100% SAFE AND SUCCESS] Follow our instruction ,Release them in sky.The Chinese lanterns can fly up to 3000ft high until it become a small light in the sky. Don't forget make your wishes so the flying Chinese lanterns will take them to stars. [100% GUARANTEE] Each sky lantern is pre-assembled ,can release in the sky by following our video or instruction.You can get replacement or refund if there is any lantern failure. [CHECK WITH FIRE MARSHAL FIRST] Some of the states don't allow to fly the sky lanterns. It is recommended that check with the local fire marshal before buying. There are safety suggestions on the instructions and the details page below. We don't want our good memories become bad, please go through them carefully. [SPECIAL MEMORY IN SIMPLE LIFE] With our qualified Chinese Sky Lanterns, you will have romantic, beautiful and meaningful memories. These flying lanterns are safe and quiet compared to fireworks. It is suitable for all kinds of special days, like Weddings, New Years Eve, Christmas ,Graduations, Anniversaries, Valentines, Beach Parties, Outdoor bonfires, Birthdays, Ceremonies, and any other festive event. Have you ever heard the story about Aladdin's Lamp? Just give a puff to the lamp, You will get three wishes. lantern for wishes. We believe that once it flies to the sky, it will convey our wishes and make our dreams come true. --High quality flame resistant paper. Package: Sky Lanterns(10 pcs) , special solid fuels included. objects, tall buildings, and airports when using the Sky Lanterns. Never fly your Sky Lanterns within 5 miles of an airport. 2.Keep Sky Lanterns away from children unless properly supervised by adults. 3.The Sky Lanterns can only be used with the accompanying fuel cell, DO NOT try to replace with other flammable objects. 4.Sky Lanterns should be allowed to fly freely once they are fully lit, DO NOT hold it down for long periods of time. 5.DO NOT hang anything under the Sky Lantern. 6.Never allow others, or yourself to handle sky lanterns while under the influence. 7.Do not use Sky Lanterns that have been damaged or torn. 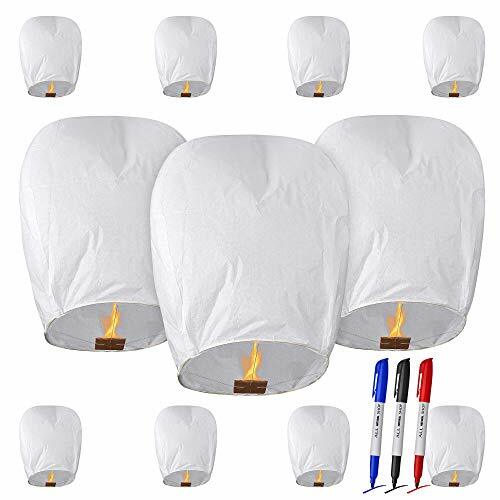 Premium Quality: The flying lanterns bid farewell to the traditional ones, the use of new fire-retardant paper makes them not easily burn if the chinese sky lantern catches fire. Easy to Ignite: The Chinese lanterns are equipped with a separate wax block, which is made of paraffin and asbestos , easy to ignite. Environmental- friendly: The sky lanterns are100% Biodegradable,They will finally get carbonization once caught in the fire. Elegantly Designed: Flying paper lanterns are really great for birthday party, wish, wedding and any other memorable celebration events. Stylish and elegantly designed, they are suitable for many events and can be decorated or drawn on. Guarantee: If You have any Question, Please Contact us Anytime, We will Reply You in 24 Hours. personal messages, wishes or your lover? ?s name on the lantern paper. Package included: 10 X SKY LANTERNS,Each paper lantern lights up the night sky for an unforgettable experience. Our premium Chinese festival lanterns are perfect for weddings, New Years Eve, graduations, anniversaries, any other festive event, valentines, parties, outdoor bonfires, birthdays, memorials, ceremonies, funerals, Christmas and just because. Assorted Colors which consists of yellow, green, white, pink, blue, purple, red and orange. We will mix the colors for you according to inventory on hand. Made from superior quality, flame retardant paper,Safe and easy to use. 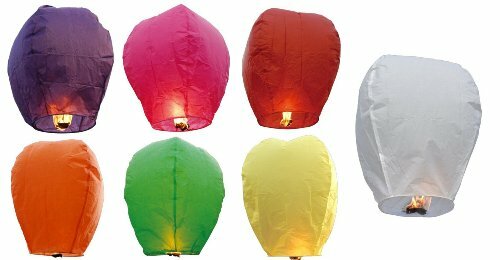 20 White Assorted Shape Flying Sky (Floating) Lanterns. Made from fire resistant paper and include a wire metal frame. Fuel cells included. Simple assembly required. DISTANCE: Sky Lanterns can fly up to 1,000m! 100% CUSTOMER SATISFACTION GUARANTEE! - When you're happy, we're happy! Buy with the confidence of our Satisfaction Guarantee. WHAT'S INCLUDED? 20 Eclipse White Flying Chinese Sky Lanterns. Please note that 20 detached fuel cells are included. Simple assembly required! INTENDED USES: Fun for family events, birthday parties, memorials, funerals, and romantic outings with your loved one.